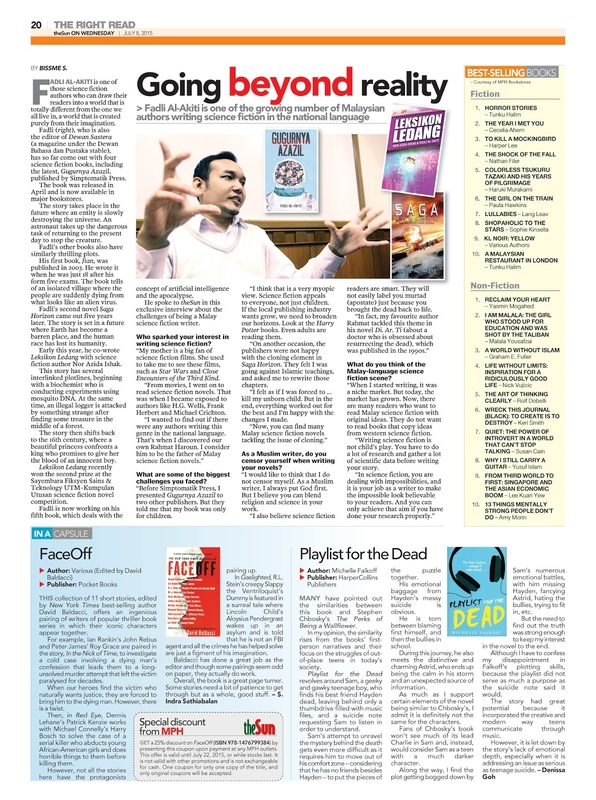 Today theSun published my interview Fadli Al- Akiti who spoke about writing science fiction in his national language. FADLI AL-AKITI is one of those science fiction authors who can draw their readers into a world that is totally different from the one we all live in, a world that is created purely from their imagination. Fadli who is also the editor of Dewan Sastera (a magazine under the Dewan Bahasa dan Pustaka stable), has so far come out with four science fiction books, including the latest, Gugurnya Azazil,published by Simptomatik Press. The book was released in April and is now available in major bookstores.The story takes place in the future where an entity is slowly destroying the universe. An astronaut takes up the dangerous task of returning to the present day to stop the creature. Fadli’s other books also have similarly thrilling plots. His first book, Jian, was published in 2003. He wrote it when he was just 18 after his form five exams. The book tells of an isolated village where the people are suddenly dying from what looks like an alien virus. Fadli’s second novel Saga Horizon came out five years later. The story is set in a future where Earth has become a barren place, and the human race has lost its humanity. beautiful princess confronts a king who promises to give her the blood of an innocent boy. Leksikon Ledang recently won the second prize at the Sayembara Fiksyen Sains & Teknology UTM–Kumpulan Utusan science fiction novel competition. Fadli is now working on his fifth book, which deals with the concept of artificial intelligence and the apocalypse. He spoke to theSun in this exclusive interview about the challenges of being a Malay science fiction writer. *Who sparked your interest in writing science fiction? My mother is a big fan of science fiction films. She used to take me to see these films,such as Star Wars and Close Encounters of the Third Kind. From movies, I went on to read science fiction novels. That was when I became exposed to authors like H.G. Wells, Frank Herbert and Michael Crichton.I wanted to find out if there were any authors writing this genre in the national language. That’s when I discovered our own Rahmat Haroun. I consider him to be the father of Malay science fiction novels. *What are some of the biggest challenges you faced? Before Simptomatik Press, I presented Gugurnya Azazil to two other publishers. But they told me that my book was only for children. I think that is a very myopic view. Science fiction appeals to everyone, not just children. If the local publishing industry wants grow, we need to broaden our horizons. Look at the Harry Potter books. Even adults are reading them. changes I made.Now, you can find many Malay science fiction novels tackling the issue of cloning. * As a Muslim writer, do you censor yourself when writing your novels? I would like to think that I do not censor myself. As a Muslim writer, I always put God first.But I believe you can blend religion and science in your work. I also believe science fiction readers are smart. They will not easily label you murtad (apostate) just because you brought the dead back to life.In fact, my favourite author Rahmat tackled this theme in his novel Di. Ar. Ti (about a doctor who is obsessed about resurrecting the dead), which was published in the 1990s. *What do you think of the Malay-language science fiction scene? When I started writing, it was a niche market. But today, the market has grown. Now, there are many readers who want to read Malay science fiction with original ideas. They do not want to read books that copy ideas from western science fiction.Writing science fiction is not child’s play. You have to do a lot of research and gather a lot of scientific data before writing your story.In science fiction, you are dealing with impossibilities, and it is your job as a writer to make the impossible look believable to your readers. And you can only achieve that aim if you have done your research properly.